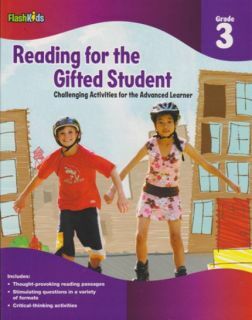 For the more advanced student whose level of reading skills, critical-thinking abilities, and interests go beyond his or her current grade level. The reading passages are thought-provoking and non-fiction, taken from the areas of science, social studies, history, and the arts. They present new vocabulary challenges and a range of fascinating topics. The reading comprehension questions that follow are in a variety of formats to test their analytical, synthesizing, and evaluating skills. 192 pages in full color illustrations. Answers at end of the workbook.